Our All-Day Childcare Program has moved to it’s NEW location! We are now located at 2323 Scott Street. Phone 402-806-4520 for more information! The Y is currently accepting applications for our All-day Preschool, and our Before and After School Program. Why the Y for Preschool? 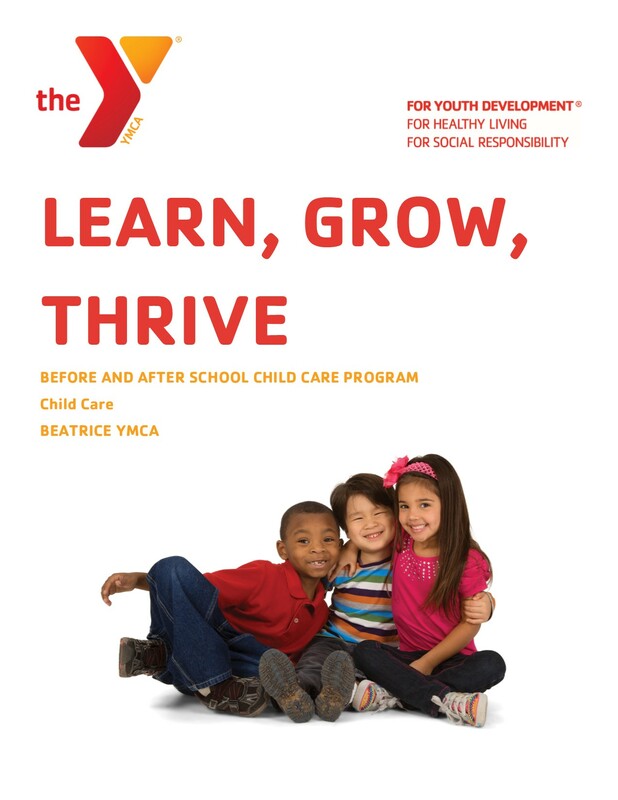 At the Beatrice YMCA Preschool, we believe that children are strong, capable learners who learn best through social and environmental interactions. That’s why we strive to provide opportunities for children to learn through play, both individually and in groups. Our hope is that our preschool will feel like home to you and your child, filled with nurturing love and care. Our fees include care Monday through Friday from 6:30 am – 6:00 pm, preschool curriculum from 8:45 am – 3 pm, breakfast, lunch, and 2 nutritious snacks every day. 6:30 am – 12:30 pm M, T, TH, F and all day Wednesday; includes breakfast, lunch, snack and gymnastics $105/week. 12:30 pm – 6:00 pm M, T, TH, F and all day Wednesday; includes lunch, snack, swim lessons and dance time $105/week. All day Wednesday 6:30 am – 6 pm; includes breakfast, lunch and snacks $30/day. When signing up online be sure to select the correct package. Why the Y for Before and After School Care? *Scheduled School Day Outs will be $25 per day with any of the above packages. All packages include snow days. For more information email Missy Lamkin at mlamkin@beatriceymca.org. You can either register for both preschool and before and after school online by clicking on HERE, or you can pick up a packet at the front desk. Below are the links to all the paperwork needed to have on file for your child to attend either Preschool, Summer Camp or our Before and After School Program. Before and After School Child Care! Once children reach school age, multiple influences enter their lives. Our Before and After School Program ensures that the time out of school is occupied creatively and constructively. Our child care program provides you the opportunity to work with the peace of mind knowing that your child is being cared for in a safe, nurturing and structured environment. Before/After School Child Care follows the Beatrice Public Schools Calendar. We strive to provide a safe, fun and happy environment for elementary school children by providing a wide variety of age-appropriate activities to promote self-confidence, cooperation, and team building skills. For more information, contact Missy Lamkin at 402-806-4520. Discovery Zone care is for children ages 1-7. Infants six months to one year may be accepted at the discretions of the Discovery Zone Staff.